Sensory Play is something all parents have heard of. Not only is it a whole lot of fun for your child but it is vital for childhood development. When you are looking for the best sensory toys it can get a little overwhelming with so much available on the market. We are here to help though with this easy to understand Sensory Toy gift guide. Click here to find out why Sensory Play is so important for your child. 1 What are Sensory Toys? Sensory toys are those which have been specifically designed to stimulate a child’s senses. Some toys may focus on just one of the seven senses while others may incorporate stimulus for a few of the senses. These toys have been designed to help every child’s development. They are also often recommended by therapists and doctors for children on the autism spectrum, those with Asperger’s, Sensory Processing Disorder or other conditions. Sensory toys can help children feel calmer as well as encourage them to learn and develop engagement. It can sometimes be challenging to find ways to stimulate a child and develop those important motor skills. Sensory toys are the perfect solution as they stimulate your child without overwhelming them. The best way to decide on sensory toys is to know your child’s likes, dislikes, and interests. An underused parenting skill is following your instinct. If you see a toy and think your child would love, then you are usually right. Be sure to think about what they show an interest in, what always makes them happy and what skills they need to develop. 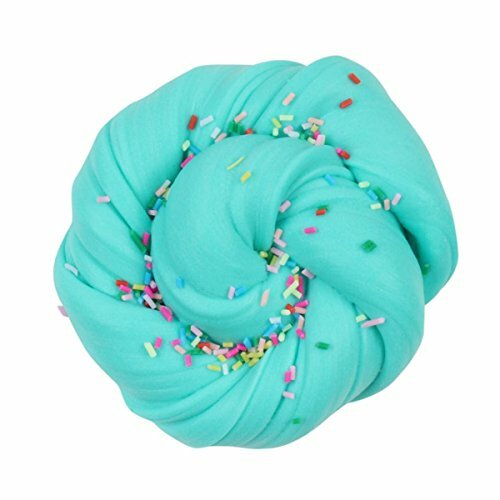 If for example, your child loves playing with homemade playdough, then you probably would go wrong with something like this Therapy Putty. If they love anything to do with farm animals or outer space be sure to find toys that incorporate those themes. Don’t overthink sensory toys too much, remember one of the most important goals is for your child to have fun playing! These toys often incorporate senses like touch, hearing, and sight while developing fine motor skills and cognitive growth. 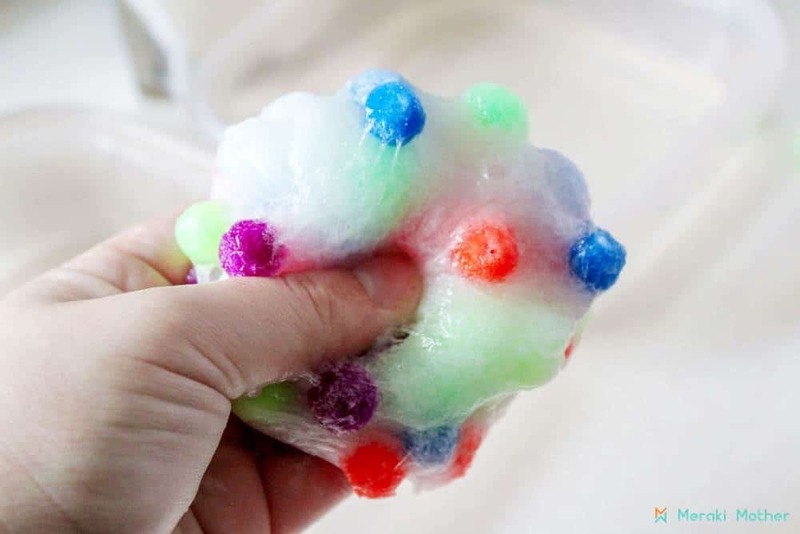 Here are some of our favorite messy play sensory toys. This fun water toy is perfect for bathtime. 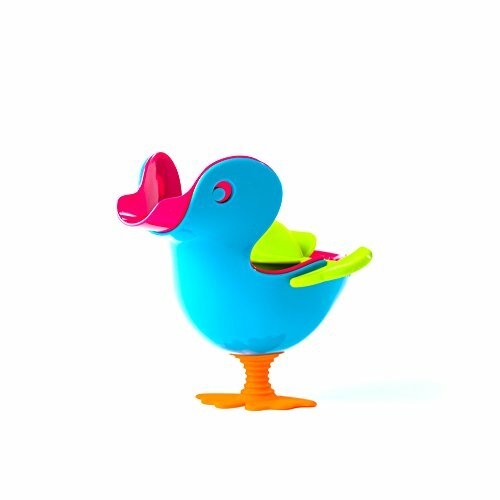 With stackable parts, spinning wings and a beak that pours water, your child will have fun experimenting, using their imagination and learning. All while developing fine motor skills and learning about cause and effect. Best For Ages: 1-4years old. 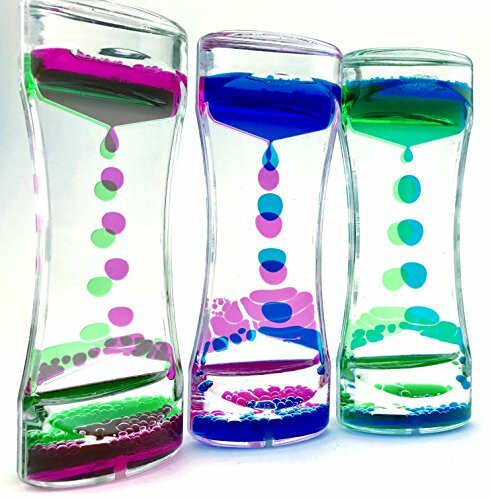 We Love: The bright fun colors as well as the fact that it is nontoxic and BPA-free. A sensory Bin can be used in so many ways and it is easy to structure play around your child’s interests. 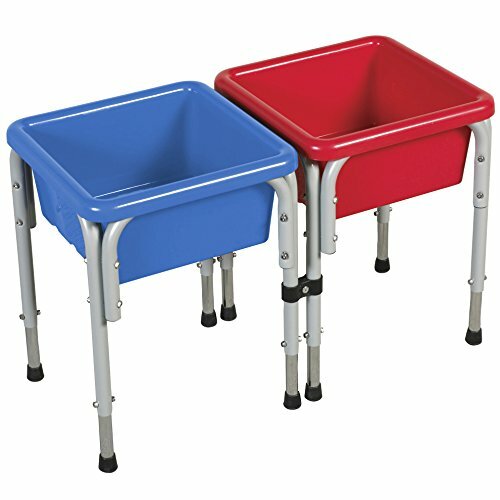 These bins are weather resistant and perfect for indoor or outdoor play. 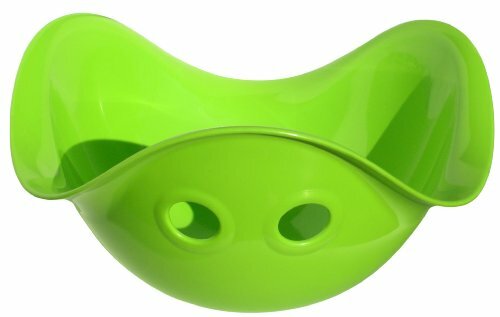 They are easy to clean and come with lids so you can store your sensory play safely. 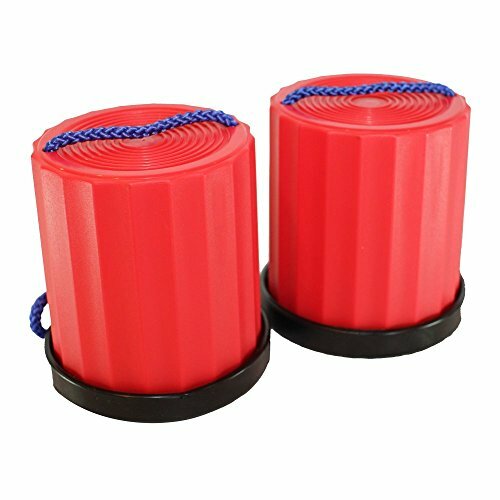 These come as a duo so you can use one for water play and one for sand. Best For Ages: Ages 3 years and up. We Love: The adjustable legs which allow them to be the perfect height for your child. It is also easy to drain water from these bins..no tipping and mess. Click to find our ultimate list of sensory play ideas for more ways to use your sensory bin. If your kids loved playdough, modeling clay is the next step to take. This clay is super soft to the touch, can be made into anything and air dries in just 24 hours. 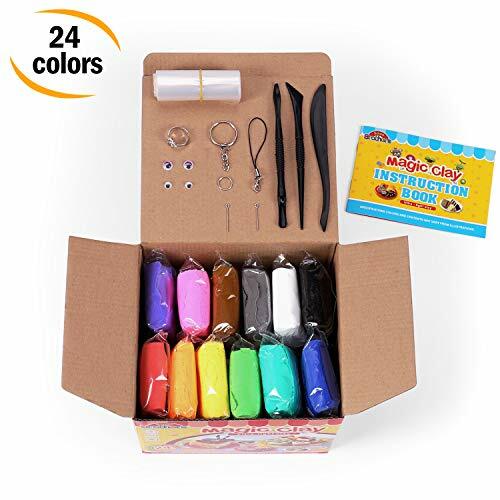 With 24 fun and bright colors, there is so much possiblity for your child’s imagination to run wild while developing their fine motor and problem solving skills. We Love: That kids can use there imaginations to create anything they like. It is also easy to buy modeling clay instruction books that link back to your child’s personal interests. We love these one’s on animals, Fantastic Characters and this book that has 52 clay projects to create. 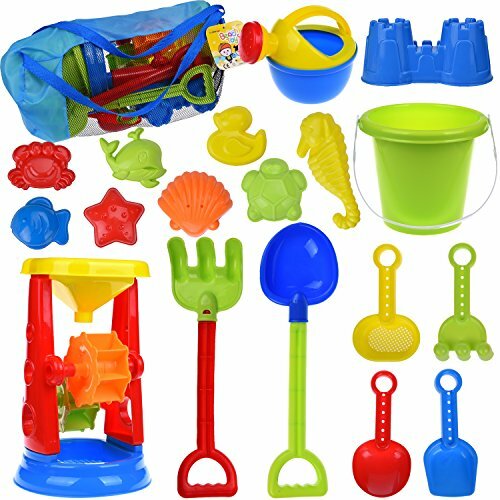 This set allows children to dig, pour, build and mould when playing with sand or water. 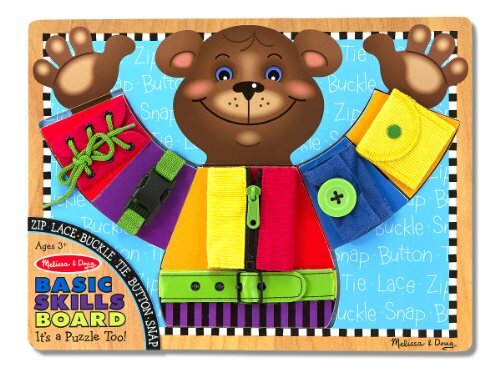 Full of bright colors and fun shapes it is stimulating and fantastic for fine motor skills and cognative growth. We Love: How versatile this set is. Take it as a beach toy in the mesh back bag, use it for water play in the bath or with a sensory bin. Making your own slime together as a family activity. Best For Ages: Check each individual product as it may vary. We Love: Okay, we admit that we make have had a few slime making disasters..what modern parent hasn’t? 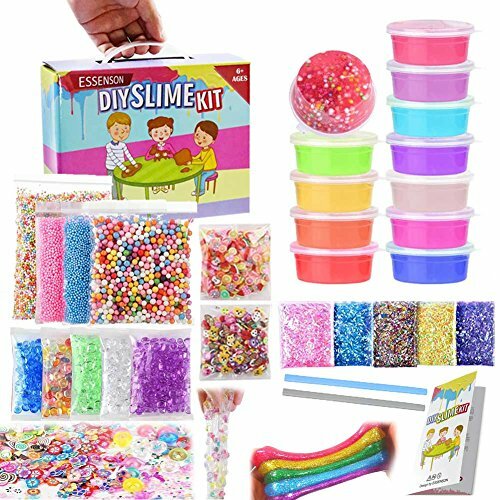 We love that we know we are going to have a fun and workable slime with these slime products. These touch sensory toys help develop a child’s fine motor skills. Tactile toys will encourage a child to use actions that involve their wrists, fingers, and hands. All these movements will help with writing skills and aid a child when they learn to dress themselves. They can also have a calming effect by reducing anxiety and stress. Everyone has seen stress balls but this set is extra fun. 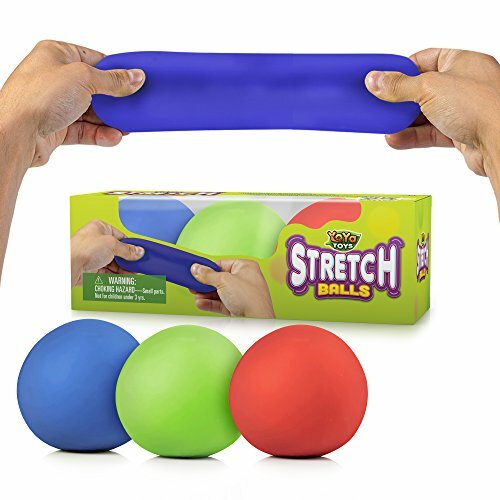 Not only can you squeeze them but they stretch and even bounce. They make a great gift for children with autism, ADHD or OCD as they make the perfect fidget toy. Manipulating these bright balls will help calm and relieve anxiety. We Love: That these toys are easy to take everywhere with you and are heavy duty materials that will last. This simple toy is great from practicing those tricky fine motor skills such as fastening a button, undoing a zipper or tieing a shoelace. Perfect for getting your child to the stage of being able to dress themsleves. We Love: That this is not just a sensory board but also a 6 piece puzzle. The ultimate sensory toy! Water beads just need soaking in water to become a fun, squishy and bouncy jelly-like bead. 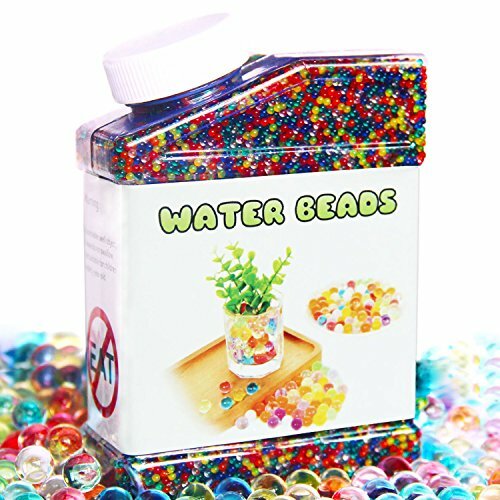 You can use these eco-friendly water beads in the bath, as part of a sensory bin or even inside a balloon or bottle for extra squishy fun. We Love: That these beads are recyclable and can be used in so many ways. For ideas on how to use water beads for sensory play click here. 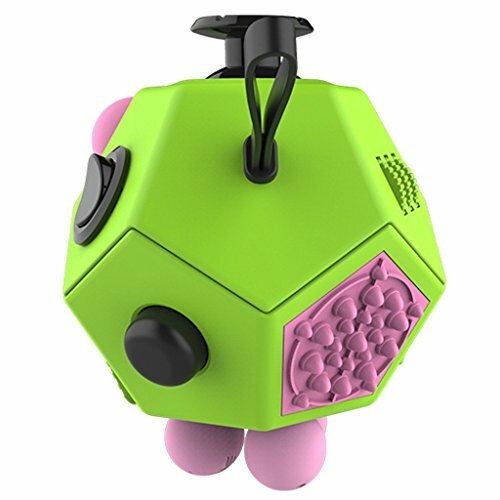 With 12 sides of fidget activities this fidget toy has something for everyone. You can roll,slide, flick, click, rub and much more. A great toy for relieving anxiety and stress as well as quickly calming children down. Best For Ages: 3 years and up. We Love: That it comes in lots of colors and is easy to take with you while out and about too. 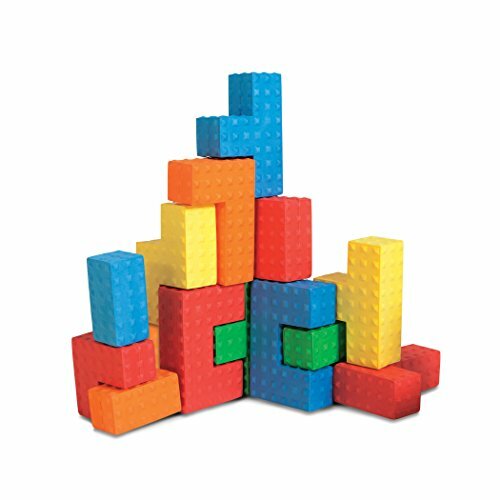 This easy-grip soft foam blocks offer so much more than traditional building toys. The brightly colored blocks are easy to stack and put together. With small nubs on each block, they are a fun tactile toy that stimulates fine motor skills as well as imaginative play. Due to the softness and easy to handle size they are a great gift for children with different abilities. We Love: That this puzzle is ideal for developing logical and spatial skills while being lots of fun. 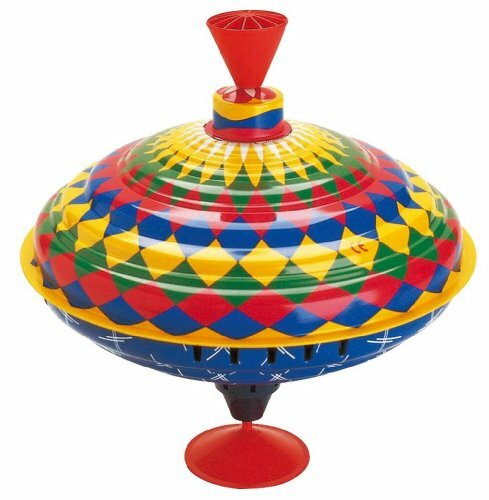 Vestibular sensory toys are great for helping develop gross motor skills as well as concentration and hand-eye coordination. 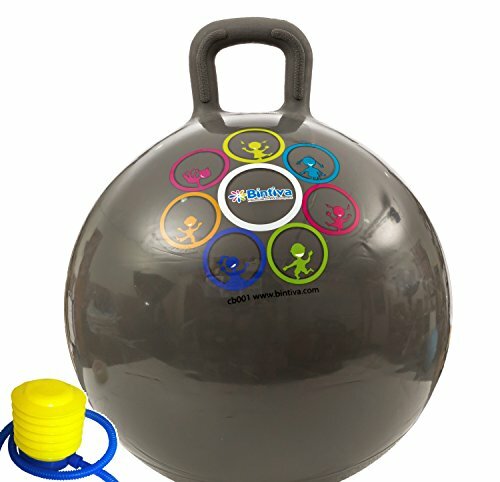 Children will love having fun with these toys while building up skills in balance, stability, strength and muscle tone. This beautifully designed toy helps encourage balance as well as developing body awareness. Use this toy inside or outside for lots of fun and uses. Some great ways to use this multi-use toy is for a balance board, a see-saw, a resting spot, a dolls bed and so much more. We Love: That the uses for this toy are endless and it will grow with your child. It may look a little strange but this toy is a fantastic sensory toy. Designed in Switzerland this toy is ideal for open-ended play. It’s fascinating to see just how many different ways children find to play with this nontoxic, shatterproof polyethylene toy. Perfect for both indoor and outdoor play as well as being easy to take with you to the park or on a playdate. Best For Ages: 2 years and up. We Love: That this toy promotes imaginative play and creativity. We are sure you remember playing with these when you were a kid. These simple stilts help balance and hand-eye coordination while building gross motor skills. With easy to adjust hand cords and non slip padding they will provide lots of fun and sensory stimulation. Best For Ages: 5 upwards. We Love: The fun memories these bring back to our own childhood. Make sure you have a go to. These special stones are inspired by stepping stones in nature. 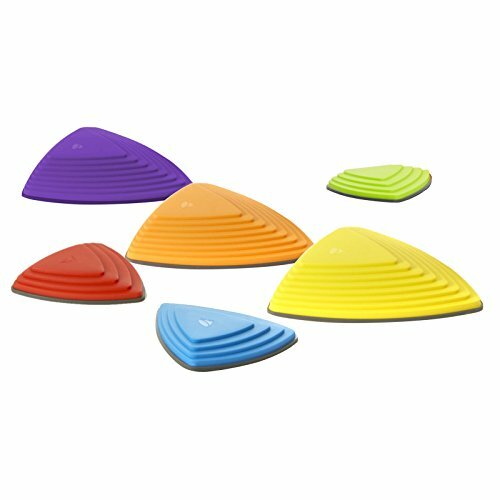 Made of non-slippery materials, they are ideal for helping to improve balance and coordination. Each side of the stone has differing difficulty and steepness with 3 large and 3 small stones in each pack. They can also be stacked for super easy storage. Create fun and challenging pathways and watch your child gain more confidence through jumping, balancing and judging distance. We Love: That this toys can last a whole childhood. Can also be extra fun for a childrens birthday party game. Having fun bouncing around is a great way for your child to strengthen their body while devolping coordination and cognitive skills. 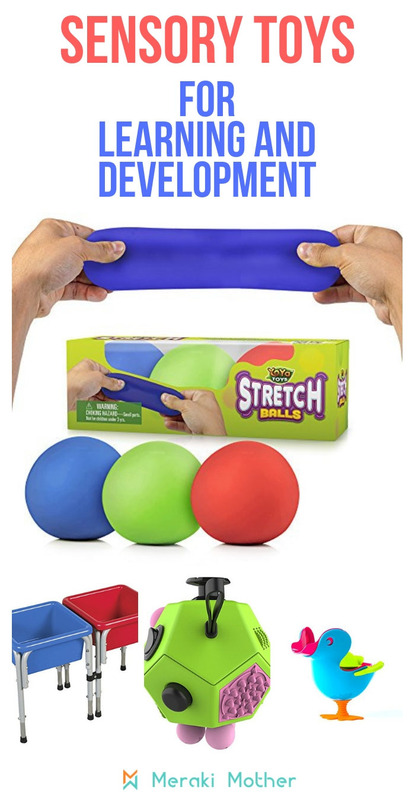 This toy is easy to handle for children and has an easy to grip handle. We Love: That this comes with a free foot pump for easy inflating! These aromatic toys are great to stimulate a child’s sense of smell. Smell is such an important part of life. 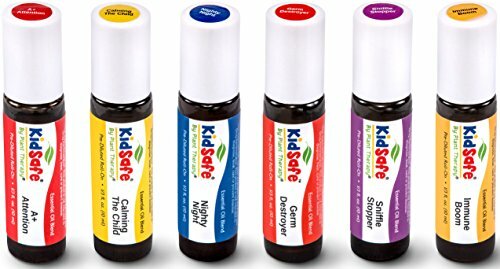 Aromas can uplift a child’s mood or help to relax and calm them. This sense is strongly attached to emotions and feelings and aroma toys help develop growth in this area. With Plant Therapy Essential Oils for every mood and childhood condition, this oil pack is perfect for any houshold that has children. Use them in diffusers, in the bath or add a few drops to homemade slime and playdough. Best For Ages: 2 to 10 years old. 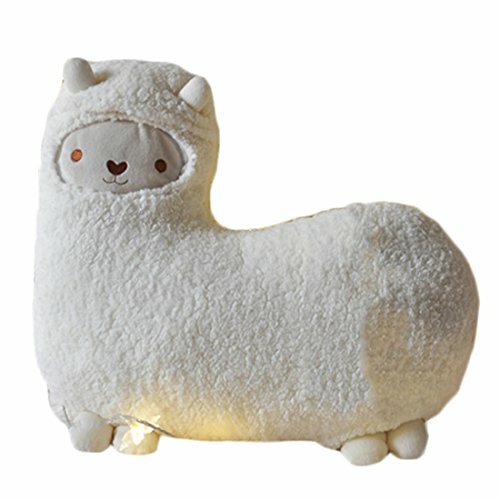 Besides being so darn cute this soft llama pillow has a removable scented sachet. We Love: It’s a fluffy llama, seriously what’s not to love. 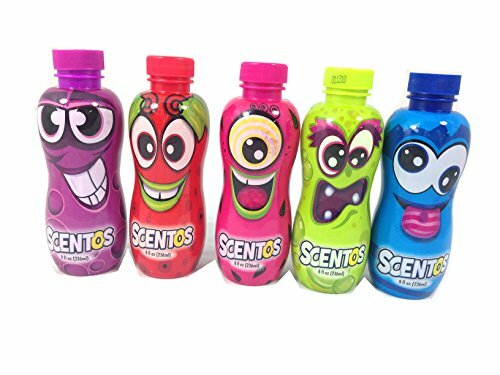 With five fun scents of Grape, Watermelon, Apple, Strawberry and Blueberry these bubbles will be sure to be a massive hit. Use them in a bubble machine, huge bubble wand or have fun experimenting what you can make bubbles with ( we love pipe cleaners). Best For Ages: 3 years and upwards. We Love: That this is just simple childhood fun. 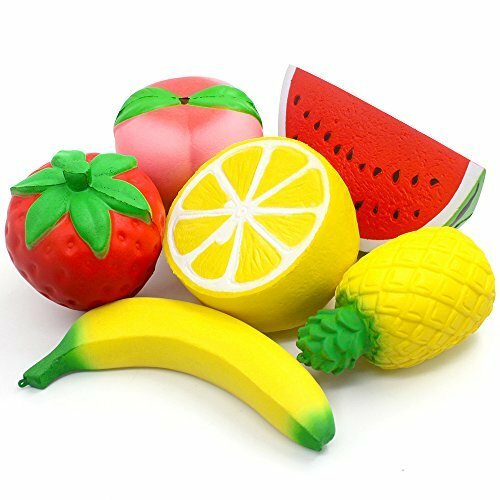 These squishy fruits are bright, cheerful and scented!. Squishies are a big hit around the globe and it’s easy to see why. They are simple, fun and can be a great way to relieve anxiety too. This set has a watermelon, banana, peach, lemon, pineapple, and strawberry. They are also a great touch sensory toy as they have different textures and shapes. We Love: These are super addictive. Have a go and you will find you can’t stop. 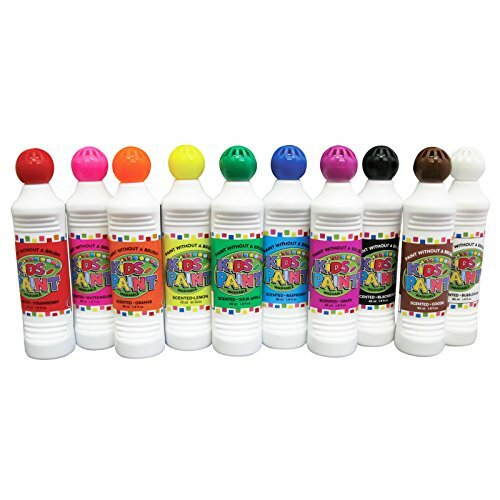 With ergonomically designed bottles and a non-leaking spring valve applicator, these paints are not only fun but help reduce waste and mess. With lots of fun and bright colors, give your child some large art paper and let their imaginations run wild. We Love: That these paints are washable. If the kids make a mess, just wash off with soap and water. These toys help develop chewing, blowing and communication skills. Learning how to move their face and mouth in different ways is a great self-awareness skill as well as helping promote speech and language skills. As we grow we often forget how important a tool our mouth and taste is. Think about how babies are always exploring by putting nearly everything in their mouths. 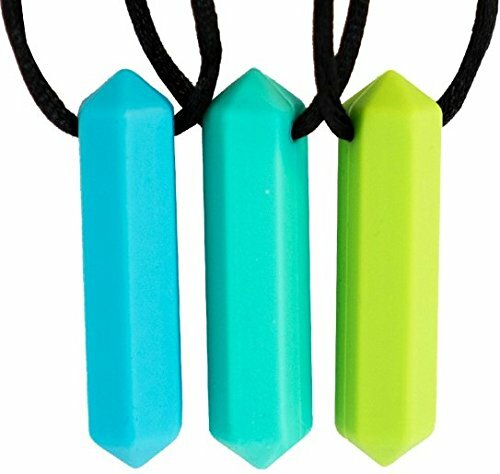 These durable but soft Sensory Chewing Necklaces can be beneficial for so many children. 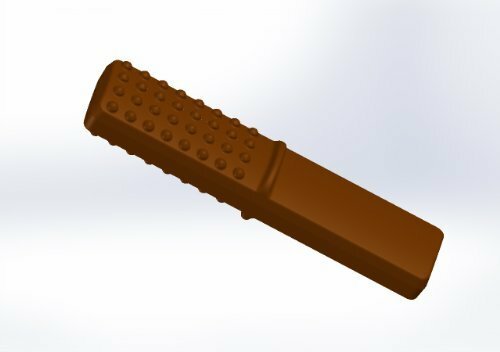 They can help stop habits such as nail biting or thumb sucking. They can also be great anxiety relieve for children who are Aggressive Chewers or have Autism, ADHD, and Oral Motor stimulation. Best For Ages: 3 years and up. If using for teething babies always use under supervision. We Love: That these are BPA and Latex free. Made with 100% food-grade silicone. 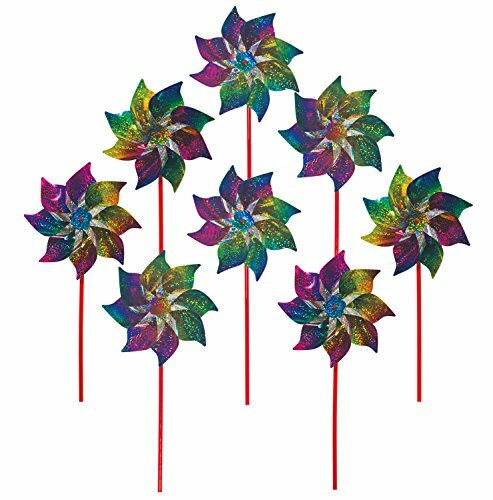 Pinwheels are a simple and fun way to help a child develop the skill to blow and strengthen their mouth muscles. These ones are holographic rainbow so are even more fun to blow and watch spin. We Love: The bright sparkly design of these. Simple and fun. Lots of fun and helps to develop inportant mouth muscles your child will use for speech development. 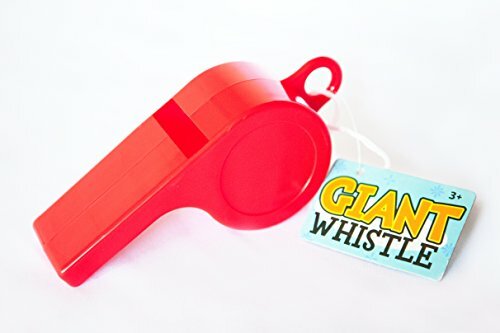 We Love: The sound this whistle makes. No shrill, ear-piercing whistle! With a low pitch and soft sound, it won’t end up being something you dread hearing. This toy is fantastic for any child with taste or oral sensory issues. Can also be a lifesaver if you have a child has aggressive chewing habits or that tends to chew clothes, hands or other objects. With different textures as well as taste this is an interesting oral sensory toy and is small enough to be easily taken with you on outings. Best For Ages: Suitable for teething toddlers under direct supervision. We Love: That it comes in lots of different flavors like Mint, Lemon and grape. By experimenting with making noise you are helping so many different senses and skills. Through learning to control sound speed and volume children learn listening skills, imitation and cause and effect. Sound is also a brilliant way to engage a child’s imagination and creative thinking. With this 22 musical piece set your child will learn how to blow, shake, beat and tap. Lots of creative fun and learning can be had. Best For Ages: Best under direct supervision as some instruments can pose a hazard. 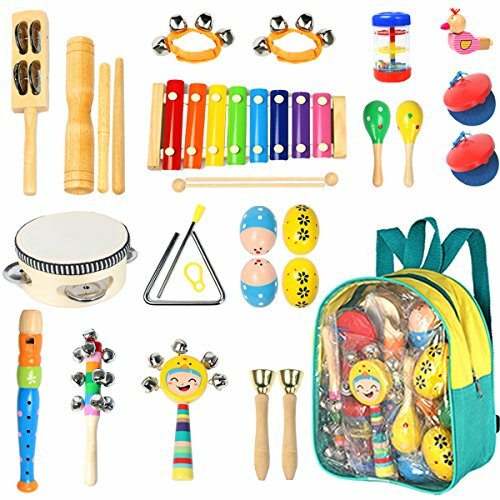 We Love: That this set contains nearly every instrument you could want to introduce to a small child. 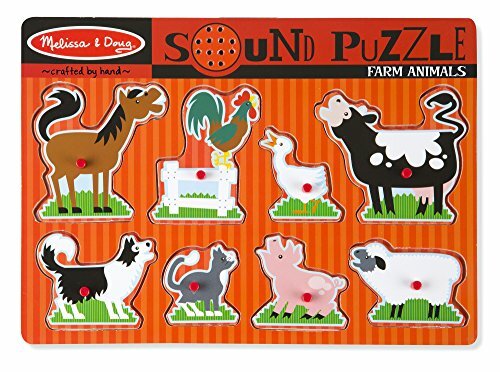 This eight piece puzzle adds the extra fun of animal sounds when your child gets the puzzle in the right spot. Great for listening skills as well as the more traditional problem solving. We Love: That this toy comes in so many different types so you can buy the one that suits your child’s interests. We love the Zoo, Pets, Vehicles and Musical Instruments designs. There is a reason why these toys have remained a firm favorite for many genertaions. 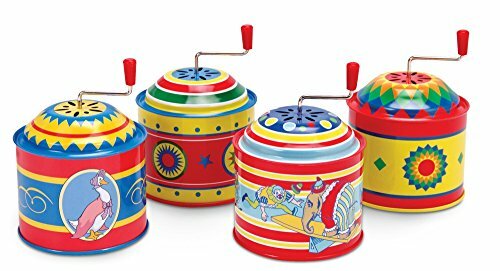 Brilliant for developing your childs fine motor skills, this twist on a classic toy also makes a humming melody which changes volume with the speed of the spinning. The bright and fun patterns also provide a point of interest for your child as they watch them merge and change as they spin. We Love: That this toy creates lots of fun noises and needs no batteries. Wind up this beautiful box to make a sound. You child will love this old fashioned, fun toy. We Love: That this toy is a change to electronic toys that require pushing buttons. 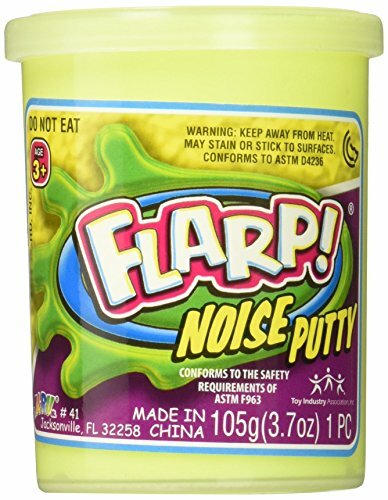 Great for squishing and making lots of fun sounds. We Love: The giggles that this fun toy causes. With bright colors, different visual effects and movement these toys help develop focus, hand-eye coordination and learning skills. 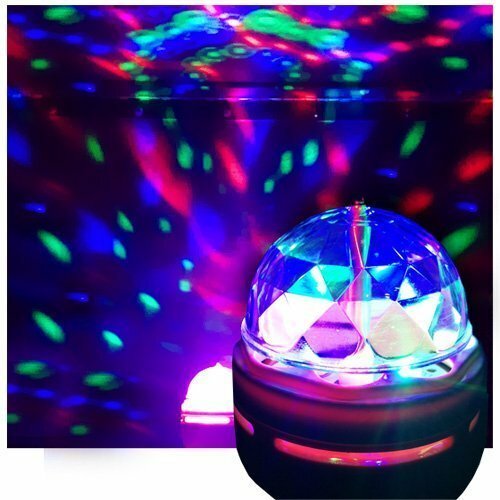 This fun ball projects bright, colorful lights on the walls and ceilings. Lots of fun to watch and dance to. We Love: To take turns in putting on your favorite songs and dancing to the music and lights. Brilliant for viual stimulation as wells as having a natural calming effect. We Love: That these come in so many different colors and designs so you can get the perfect one to suit your child. 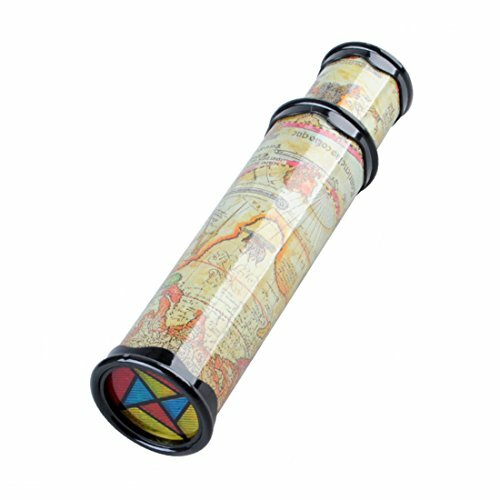 Just hold this kaleidoscope up to the light and turn to create amazing patterns and colors. Hours of simple enjoyment and visual stimulation. We Love: That with every turn you experience a new explosion of color. 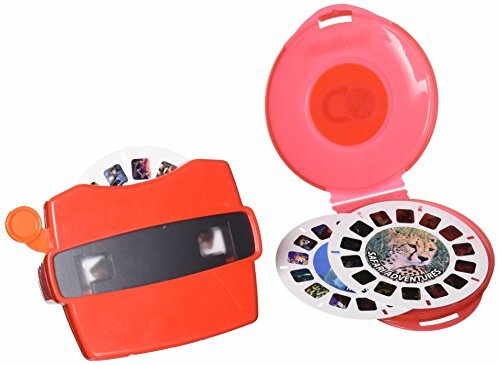 Did you have one of these as a kid? A great way for a child to see visual stories. With so many electronics in our lives this toy simplifies the story telling experience by focusing purely on the sense of sight. We Love: The memories this brings back and that there are so many sets and stories to pick from. 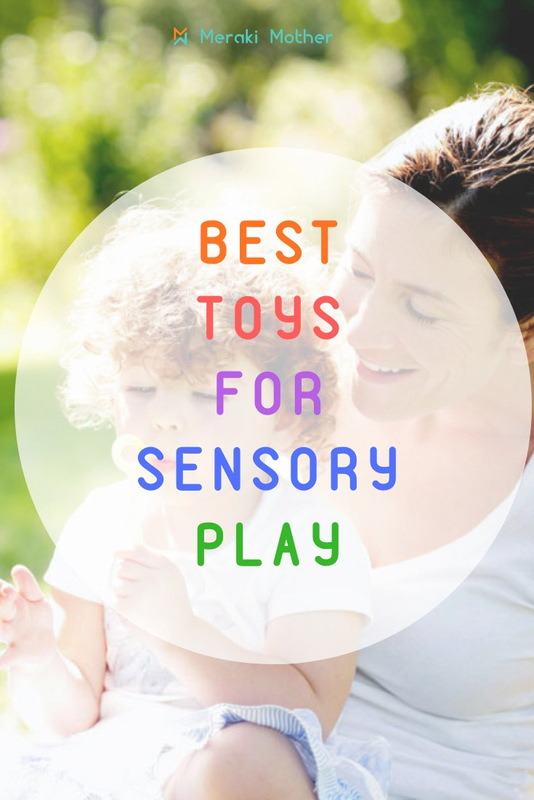 We hope that you have enjoyed this amazing list of best sensory toys and that you found the perfect toy for your child. If you have a child’s birthday coming up don’t forget to pin this for later.